As typos come in advertising, here’s one of those instances you’d wish it was true. You’d think who ever typed this up might find this a little fishy but well, there’s apparently 160GB on this N8. This was tweeted to us by @KobusNell , you can see the Rand currency (Kobus is in South Africa). The funny thing is, eventually we’ll reach there. I remember the 32mb (yes MB) RS MMC card for my Nokia 7610. I was so delighted to have so much space when I got to 512MB! Never having to delete photos and videos, lol. Gradually over time with the likes of N93, moved up to 1GB, then 2GB, then 8GB on my N95/N82. My N800 had two 2GB SD cards inside 🙂 32GB built in was so satisfying on the N97/N900. Shame the N97 needed so many hard resets 🙂 oh and with options for microSD still. I only just put an additional 16GB on my N8. The only 32GB card I have is for my 60D (that eats memory like nobody’s business). What with 1080p slowly becoming a standard, as well as huge camera sizes it won’t be too long till we actually see 160GB phones. 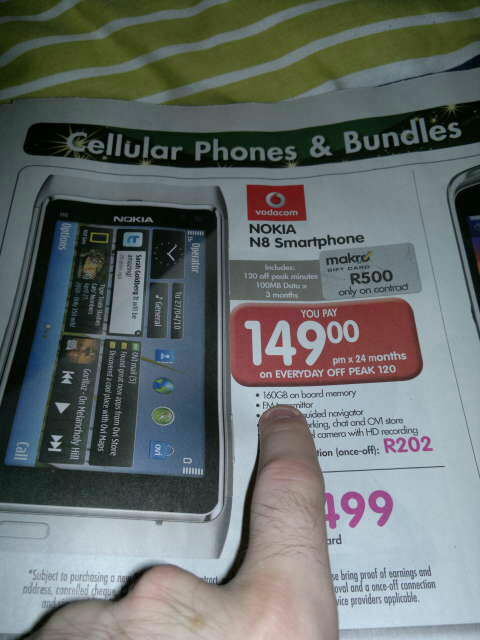 The N9 is already 64GB (as well as the iThang 4S). Some tablets (with netbook like features already have that kind of storage, and more. Any guesses when we’d see such large in built memories in phones?